Hi, I’m Kim. I’m a teacher, writer, speaker, and body positive advocate. I work with intelligent, kind, committed women who ALWAYS want to do the right thing. The trouble is our urge to do right and be excellent can sometimes be used against us - often by us. We apply external body and beauty expectations against ourselves. It causes real and lasting harm. This is not what we want to pass onto future generations. This is not how we want to live our lives. We want to be ourselves, express ourselves and finally do those things we always talk about doing. This is our work together. Learn more about me and this work here. If you aren't able to find what you are looking for, if you reach out to me or one of the people here and what services and location you are looking for, we can help. A lot of providers (myself included) will offer online services no matter where you are in the world. There is no one right way to feed a body. A healthy body comes in multiple sizes. Healing is at the heart of this. Healing does not come in a one size fits all meal plan. 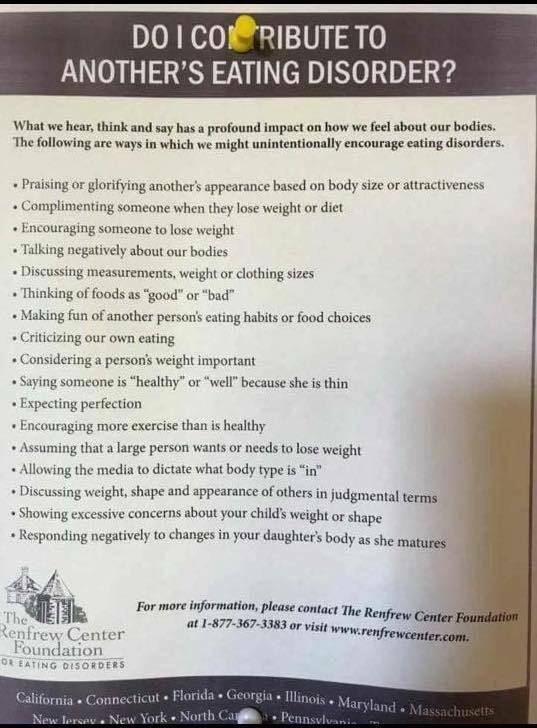 There isn’t one contributor to eating disorders and disordered eating, but often society as a whole. We compliment women on smallness. We compliment people on size. We label foods and good or bad. We live in a culture constantly telling us what is wrong with us. It's not about food. Food is a tool and that has been used as a coping mechanism. This isn't about eating more or eating less. It's about listening to what someone needs. The person suffering is often the wisest in the room. I believe we can make a change to this world and and there is another option. We are all in this together and we can make a change together. I believe in us. An important read for all humans. A lot of times we don't see how our small actions can make a big difference for those experiencing a negative relationship with food or have recovered. This is not just about eating disorders, this is about all food. That's take action together. We can stop the BS (the billion dollar diet/"lifestyle change"/ "wellness" industry). YOUR VOICE, YOUR ACTIONS - they make a difference. All my love. I talk about diet culture, self compassion, perfection and create spaces for people to feel seen + heard.